“Rhyming Expressions” is a fun activity, especially if the person with dementia or Alzheimer's is a poet and didn’t know it! Find the rhyming answers to the clues and then find some more rhymes. Lots of fun talking about some of the funny answers and telling stories that the phrases draw out. 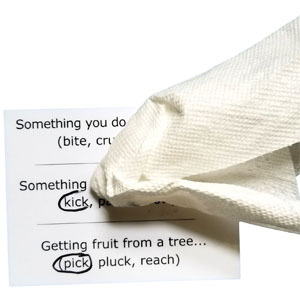 The activity includes a set of 48 cue cards, each with three phrases and three potential answers for each phrase. 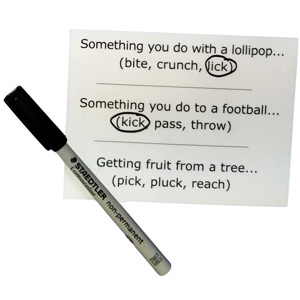 Use the included wet erase marker to circle the answer that not only is correct, but also rhymes with the other answers on the card. The instructions describe how to use the activity for various levels of ability. A great activity for people with dementia or Alzheimer's with more ability. The green cards are used to introduce the activity. 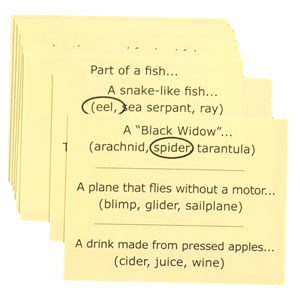 Because two of the answers are already circled, the person can read the answers, recognize that they rhyme and choose the rhyming answer for the third phrase more easily. 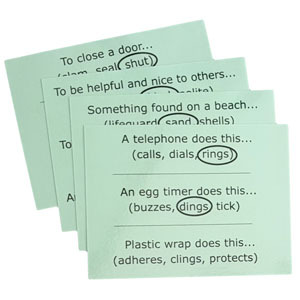 Once the answer has been circled, use the phrases to encourage conversation and memories. Talk about the other suggested answers and see where that leads! Try to find more words that rhyme. The yellow cards have the answer to only the first phrase circled. This adds more challenge to the activity because there is no starting rhyme. Once the person is ready for even more challenge it is time to move on to the white cards, which offer no clues. The instructions describe how to ensure that the person does not become frustrated and to guide them to success. When done, ask the person to help you by cleaning the marker off the cards, sorting them by color and putting them away in the case. You will be amazed by the look of satisfaction from helping out by putting the game away on their own!